Stay informed up to the minute with a wide range of broadcasts including AM, FM, shortwave and seven pre-programmed NOAA weather stations. 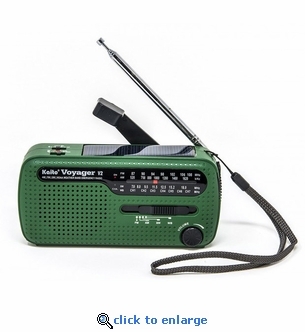 Set the Voyager to standby mode to automatically turn on the radio and receive emergency weather alerts in your area. Radio Bands: AM/FM, Shortwave Channels and 7 NOAA Weather Bands. 3 LED Flashligh and Flashing Red SOS Beacon Light.